The gorgeous, and very rare, baby zebra arrived safely in the early hours of Friday 11th December and is the only Hartmann’s mountain zebra to be born in the UK this year. The stripy new addition, who is yet to be named, is the second son of adult mare, Helene, after an 11-month pregnancy (the average zebra pregnancy is 13 months!). Shortly after the little one’s arrival, keepers set up a camera to monitor his progress and make sure he was feeding properly. Although the adorable lad soon looked to get the hang of it! 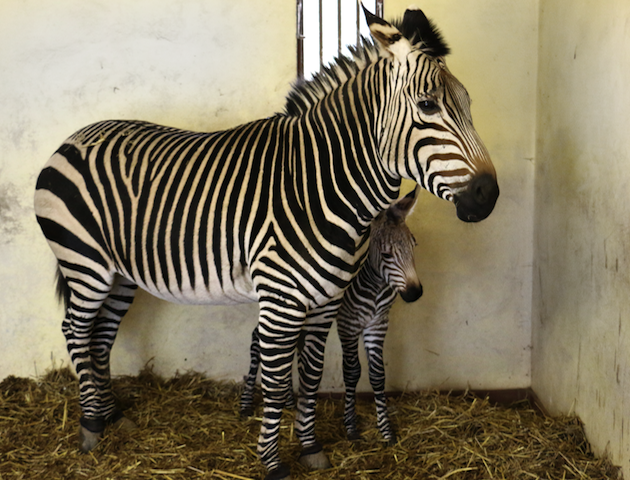 The newborn takes the number of zebras at Blackpool Zoo to three, including resident male Fernando. He is the third of this vulnerable species to be born at Blackpool Zoo in the last five years. His big brother, Tebogo, made history when he was born in 2011, becoming the first Hartmann’s to be born anywhere in the UK for nine years. Hartmann’s mountain zebras are listed as vulnerable, meaning they are at high risk of extinction in the wild as their total population is under 9,000. Native to Namibia the zebras are usually found in small groups and are agile climbers. But sadly, current studies show the number of Hartmann’s mountain zebras in the wild could decline by more than 10 per cent in the next 25 years due to an increase in hunting and loss of natural habitat.